Thank you for your interest in Isolator. Please complete and submit the form below and an ADInstruments representative will aim to get in touch within one working day. If you’d like to speak to someone immediately, office contact information is available from the contact page. Designed for use with the ML1001 Electronic Stimulator, to insulate its output from ground. The Isolator is designed for use with the ML1001 Electronic Stimulator to insulate the output from ground. This minimizes the area of stimulation to ensure greater precision, while reducing stimulation artifacts and facilitating the observation of evoked action potentials. Numeric power indication: Indicates the amount of power that goes through the device. Constant-voltage/current output of both positive and negative polarity: The device can output the biphasic wave constant voltage that is essential for evoked action potential induction during experiments with cells and other samples. Excellent input and output linearity: The output changes linearly with respect to the amplitude of the input signal. Built-in over current alarm: An alarm is generated when the electrode resistance of the load is too large for the set current to pass. 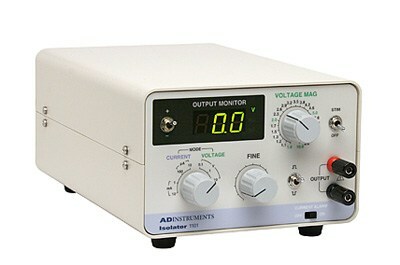 An alarm is generated when the guaranteed range of stimulation current is exceeded.